Thessalonica was originally an ancient town named Thermai, meaning “Hot Springs.” In time it became an important city because of its strategic location near the Aegean Sea. In the Roman Empire, it became the capital of the province of Macedonia and its largest city with 200,000 people. Thessalonica stood on the Via Egnatia, the Roman highway to the East, making it an important city of commerce. In Paul’s day it was a self-governing community with enough Jews in residence to warrant a synagogue (Acts 17:1). On his second missionary journey while Paul was in Troas, God showed him a vision of a man from Macedonia saying, “Come over and help us.” Paul and Silas went, stopping first at Philippi, where they preached, and a church was formed. After spending a night in prison for driving an evil spirit from a girl, Paul and Silas were forced to leave Philippi. They went down the road to Thessalonica. For at least three Sabbath days Paul reasoned in the synagogue with those present, and many believed the gospel. However, he probably ministered in Thessalonica for a longer time than just three weeks in view of what he wrote that he had done there. Those who responded to the message of Christ’s sufferings and resurrection were Jews and God-fearing Greeks. There were also some leading women of the city and many idol-worshipping pagans. This angered a group of unbelieving Jews who then stirred up a gang of roughnecks to attack the house of Jason where Paul and his friends had been staying. Unable to find the missionaries, the mob dragged Jason before the magistrates who simply commanded him to keep the peace. Convinced of the danger for Paul and Jason, the Christians sent Paul and Silas away from the city by night to nearby Berea. Paul and his party began their evangelistic work in Berea in the synagogue, as was their custom. However when many Jews there believed, the Thessalonian Jews came down to Berea and stirred up more trouble. The Berean Christians sent Paul away to Athens, but Silas and Timothy remained in Berea. Having been sent for by Paul, Silas and Timothy joined Paul in Athens, but he soon sent Silas back to Philippi and or Berea, and Timothy back to Thessalonica. Later both men returned to Paul while he was in Corinth with a financial gift from the Christians in those Macedonian towns. Timothy’s report of conditions in the Thessalonian church led Paul to write the first letter shortly after he arrived in Corinth about A.D. 51. Some of the Thessalonians apparently believed that Jesus Christ was about to return momentarily and had consequently given up their jobs and had become disorderly. Some worried about what had happened to their loved ones who had died before the Lord had returned. Persecution from the Gentiles as well as the Jews still oppressed the believers who were nevertheless holding fast to the truth and eager to see Paul again. Some outside the church, however, remained hostile to Paul. There also appears that some within the church had returned to their former habits involving sexual impurity. It seems that Paul had at least three purposes in mind when he wrote 1 Thessalonians. First, he wanted to encourage the Christians in Thessalonica who were making good progress in their new faith. Second, he desired to correct misinformation about himself and his fellow missionaries that some of his critics in Thessalonica were circulating. Third, he wrote to give additional instruction that would contribute to the Thessalonians’ spiritual growth. 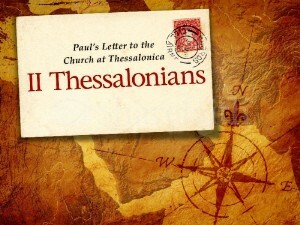 Upon receiving back news about the Thessalonian church, Paul wrote the second letter perhaps within a few months of the first one. Some of the news was good. 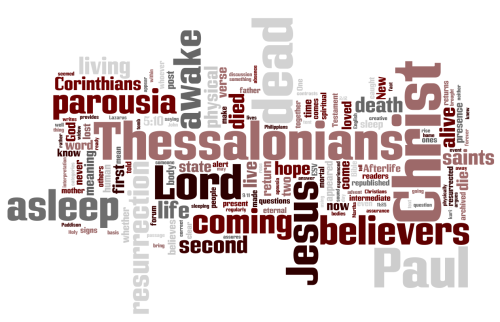 The majority of the Thessalonians were continuing to grow and to remain faithful to Christ in spite of persecution. Unfortunately some of the news was bad. False teaching concerning the day of the Lord had entered the church and was causing confusion and leading some of the Christians to quit their jobs in expectation of the Lord’s imminent return. Paul wrote 2 Thessalonians to commend his children in the faith for their growth and faithfulness, to correct the doctrinal error about the day of the Lord, and to warn the idle to get back to work.